Caption slip reads: "Photographer: Miller. Date: 1957-10-01. Reporter: Donoghue. Assignment: Hollywood Comedy Club "Old Timers". Special Instructions: Monday. 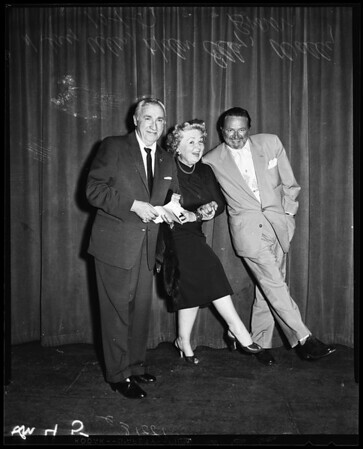 3 & 4: L to R, front: Joe E. Brown and Jack Northworth, author of 'Take me out to the Ball Game' and 'Harvest Moon' with Johnnie Morris, veteran vaudevillian in rear. 42 & 43: L to R: Jack Northworth, author of 'Take me out to the Ball Game,' Viola Dana, who started in 'Poor Little Rich Girl' in 1913, and Eddie Parkes, vaudevillian who was once teamed with Jackie Coogan's dad. 41: Buster West, Buster West, Jr. and Lucille Page (Mrs. West) showing part of their family comedy, dancing and singing routine. Members of Hollywood Comedy Club, live in New Hampshire, but mostly on road. Still Vaudellians. 45 & 46: H. Jay Ulis, of famous vaudeville team of Ulis & Clarke (his wife was Clarke), Helen Eley, leading lady in "Sinbad" at New York's Winter Garden with Sl Jolson in 1920's, and Wally Brown, ex-vaudevillian now playing major supporting roles in Hollywood westerns. 123 & 124: L to R: Della Mae Emerson (The Baroness) and husband, Eddie Emerson (The Baron), Julia Rooney (on piano) of famous Pat Rooney family, and Harry Weber, who played Music Halls on Barbarey Coast. Rose Perfect, star of George White Scandals 25 years ago, and Sam Hearn, president or head-liner of the Hollywood Comedy Club, and the Sam Schlepperman of the Jack Benny Show. Miss Perfect also vaudeville star, performing in London Palladium, Paris, "Little Club" of Shanghai, and throughout Europe. 224: L to R, front: Al Herman, Frank Orth, author of "Mrs. Grundy Always Washed on Monday," at piano keys, and Lousi Mosconi, of famous Mosconi Brothers team. Eddie Kane, veteran vaudevillian in read standing. (Orth now plays Inspector Faraday in 'Boston Blackie' TV series)."